Charcoal ($8.99) is a metallic, dark blacked grey, with teeny tiny silver shimmer. The color is beautiful and the formula of these gel liners by Maybelline are pretty amazing too. Since the shimmer isn't too obvious or chunky, the liner goes on smooth with a very creamy texture. I find the color to be pretty pigmented as well. On the eyes, it is a very nice change from the usual blacks and browns and it is one of those liners that actually looks grey on me. I use it only along the upper/lower lash line and keep it away from my waterline since it has shimmer. I love how this doesn't look very stark and looks great when worn on its own, along with some mascara and a little bit of kohl along the waterline. The creamy texture smudges really well when you want to create a soft, smokey eye. The staying power is pretty impressive too. I got about 6-7 hours after which there was just a little bit of creasing along the outer corners. Overall, I quite like both the color and the formula of Charcoal. If you like long-wearing, metallic grey eyeliners that have a smooth and creamy texture, this one is definitely worth trying out! 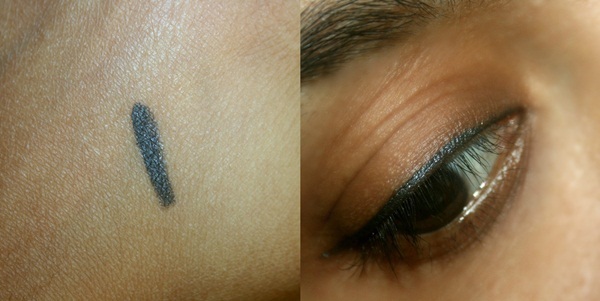 Have you tried the Maybelline Eye Studio Lasting Drama Gel Eyeliner in Charcoal? lovely! I want them in india!!! I thought Maybelline gel liners were available in India? Or is it this color?